This project is firstly a fun that I wanted to develop since many years and that was regularly postponed because of many other projects I wanted to realize too. I wanted this project a personal work, no any kind of help outside the original TI TI-99/4A schematics. The goal was that this project be as didactic as possible. For many years, TI schematics have been precious to repair my TI-99/4A computers. My detailed study of them will show me that they were not reliable: Several errors slipped inside. The first step was a precise study of the logic of the microcomputer in order to detect all the errors. It was a very interesting step. 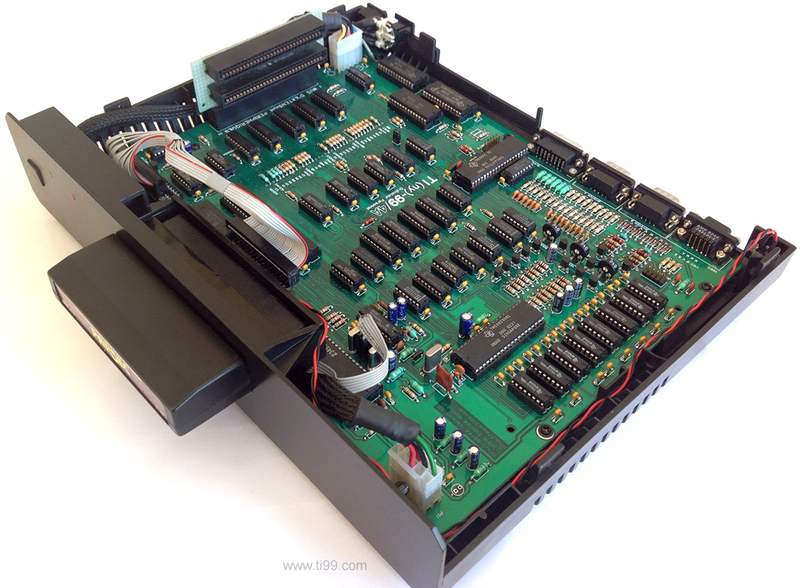 Once the TI-99/4A schematics were corrected, I begun the design of the TI(ny)-99/4A motherboard and the integration of all the improvements defined initially. Edited by fabrice montupet, Mon Jun 12, 2017 1:45 AM. Fabrice ...... you have really built the computer that in young i want have!!! And using original hw... only a word... WONDERFUL!!!!!!!!!!!!!!!! Fabrice, you are a modding genius! The art, quality, and execution of this project is mind-boggling... Chapeau bas! So cool to look at ! Oh my. That is glorious. Wow. That board looks fantastic, Fabrice! Are you planning on selling or releasing the board for others to build? That is a really nice piece of work, awesome job! The PCB looks completely professional, to the point that I wonder if you do PCB layout for a living? Very very nice implementation. I'm wondering what you used for the case? Also, are you planning to release the corrected schematics? I'm not sure anyone was aware that the TI schematics for 99/4A had errors... At lease I did not. He used bits and pieces of plastic from other cases to create the custom enclosure, then filled in the cracks and joints, sanded and painted. Truly professional job. I'm not sure anyone was aware that the TI schematics for 99/4A had errors... At lease I did not. Do we have a list of these errors (or fixed schematics)? Could he be referring to all the added wires soldered on afterwards to correct these errors and his design simply doesn't need them? Thank you so much for the compliments you made about my TI(ny)-99/4A Compuler. I began to trace the TI schematics to a PCB design software. But as and when I progressed, I encountered strange values, tensions or lines on the original TI schematics. So, at one point, I put aside the TI documents to work exclusively on my own board and improvements. I haven't listed all the modifications that I applied. Contrary to my other projects, I have not made a wire wrap prototype board, I directely design the PCB with a software. So, it permits me to easily bring modifications, improvements and to reproduce the board as I want. For this v.1.0 motherboard, I lauched the production of 5 PCB. In the near future, I will propose populated motherboards (with no case). To help eveyone to fit the motherboard into a case, I design it with ATX specifications for holes and size. Yes, I made the case from scratch, it was funny to do. I don't know of any other way to put it other than that motherboard looks beautiful, particularly how neatly arranged it all is. And the finished assembled product looks great too, kind of like a VCR or Beta player. Amazing what is being done these days with vintage computing by hobbyists. Great job! It truly is incredible.. I absolutely love the case and would prefer it over a standard ATX case but options are great. Is the jumper (shown below) used to toggle off the internal 32K on the card so one can use a SAMS in one of the two expansion slots? This is pretty close to what I want but a newer VDP would break your 1983 rule. I would also go with newer RAM just for long term availability and to save board space, but again... 1983. I understand his passion for period hardware and specifications. I love his concept and building skills. Like you if I had the skills or money to get it done, I'd probably have 1 meg SAMS capability built-in as well as wireless keyboard interface and a licensed version of an expanded F18A with HDMI output. Possibly even TIPI compatibility as well. I mean really, if I'm going to fantasize I might as well think big right? While we're at it, might as well throw in a microSD card based SSHD type of arrangement and do it all of this in surface mount for a smaller footprint. What do you do to the signal from the 9929A to convert it to RGB? Could you use a 9928A instead and get a 60Hz signal? 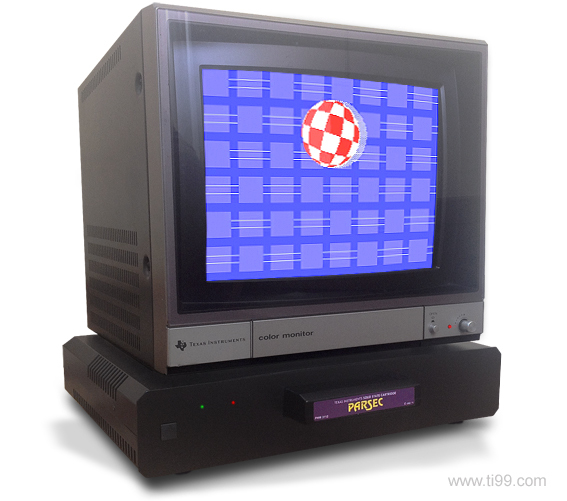 The 9928/29 output component video by default (PbPrY), and to convert to RGB is just a color space conversion. I have seen analog circuits that do the conversion, so I assume that's what he is doing. That truly is a gorgeous build... it's the clone we needed back in the day for sure! If you do ever produce the PCBs, I think I will need to buy one. I will definitely need to get one of these. . .it is just too fanastic to not have and use as a daily machine. I'm definitely in for a PCB if they become available! I've been wanting to experiment with connecting TI hardware into a coin operated arcade cabinet to use as a platform for making new 80's style coin-op games, the RGB out on this board to simplify things greatly. Edited by Tornadoboy, Mon Jun 12, 2017 5:37 PM. That is simply a fantastic build- I am in absolute awe of how the board/case looks.